Corn starch, cornstarch, cornflour or maize starch is the starch derived from the corn (maize) grain. The starch is obtained from the endosperm of the corn kernel. Corn starch is a popular food ingredient. The starch made from the endosperm of corn, containing amylose and amylopectin starch molecules. When starch is heated in water it forms a viscous, opaque paste. The paste forms semisolid gels upon cooling and has the ability to form strong adhesive films when spread and dried. 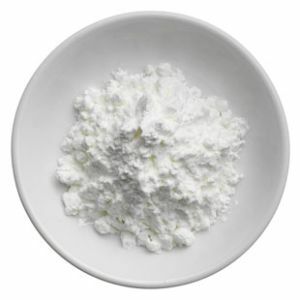 Cornstarch is not freeze–thaw stable and is used widely except when clarity or the lack of gel formation is desired. It exists as fine or coarse powders. The coarse starch is sometimes termed pearl starch. It is used in sauces, gravies, puddings, pie fillings, and salad dressings thickening soups, and is used in making corn syrup and other sugars. 1. Corn starch is used as a thickening agent in liquid-based foods. 2. It is usually included as an anti-caking agent in powdered sugar. Baby powders often includes cornstarch among its ingredients. 3. Corn starch when mixed with a fluid can make a non-Newtonian fluid, e.g. adding water makes Oobleck and adding oil makes an Electrorheological fluid. 4. A common substitute is arrowroot, which replaces corn starch on a 1:1 ratio. 5. Corn starch added to a batter which coated chicken nuggets increased oil absorption and crispness after the latter stages of frying. 6. Corn starch is the preferred anti-stick agent on medical products made from natural latex, including condoms and medical gloves. 7. Corn starch is used to supply glucose to humans who have glycogen storage disease (GSD). Without this they would not thrive and thus die. Cornstarch can be used starting at age 6 – 12 months which allows feeds to be spaced and glucose fluctuations to be minimized. Calories: Cornstarch is calorie-dense, with 488 calories in 1 cup. This can make cornstarch a benficial food choice for athletes or other highly active individuals. For example, 1/2 cup of cornstarch could fuel more than an hour of weightlifting, while 1 cup of cornstarch provides enough calories for 57 minutes of swimming laps. Carbohydrates: Cornstarch is beneficial for your health if you're on a high-carbohydrate meal plan, as each cup provides 117 g of this nutrient. Carbohydrates are your body's primary source of energy, and the Food and Nutrition Board of the National Academies recommends eating at least 130 g of carbohyrates each day. Fat: One health benefit of cornstarch is that this food is nearly fat free. Each cup of cornstarch contains less than .1 g of fat, meaning that fat provides only about .5 of the 488 calories. While you do need some dietary fat, it is high in calories, so it can make weight management difficult. Additionally, some types of fat saturated and trans fats can increase your risk of heart disease. Protein: Cornstarch is low in protein, as each cup contains .3 g of this nutrient. Like dietary fat, some protein is necessary for proper health. However, low-protein foods can be advantageous, as low-protein diets are recommended to treat certain health conditions, including gout, liver or kidney problems. Sodium: Cornstarch is beneficial because it can provide flavor yet is low in sodium. Each cup of cornstarch provides 12 mg of sodium, which is .5 percent of the daily suggested intake of 2,300 mg. Too much sodium can cause high blood pressure and water retention. Recipes using Corn Starch see Here and Here and Here. © Looped Labs Pvt. Ltd. Designed & Developed by Looped Labs Pvt. Ltd.